Hello, all! It's Lynnea and I'm back to bring you another card! I've used some more Lawn Fawn goodies from the SHOP...both older and newer products! Last week I made a summer card. The temperatures are finally getting lower and yesterday I saw an orange leaf! Hooray! It's fall!! Let's jump right in! I die cut a piece of 5.5" wide heavy weight cardstock with THIS new die from Lawn Fawn. I also cut two pieces of cardstock with THIS older die. I masked off the little houses and used Peeled Paint and THIS Distress Ink to color the grass. I inked directly onto a sidefolding card base with Broken China and THIS Distress Ink for the sky. Next, I masked off the bottom portion of the hill so that I could ink just the houses. I used THIS red Distress Ink, THIS orange Distress Ink, and THIS yellow Distress Ink. I flicked some water onto my pieces to distress them further. I stamped the wheelbarrow full of pumpkins from THIS stamp set ( you can find the matching dies HERE ). 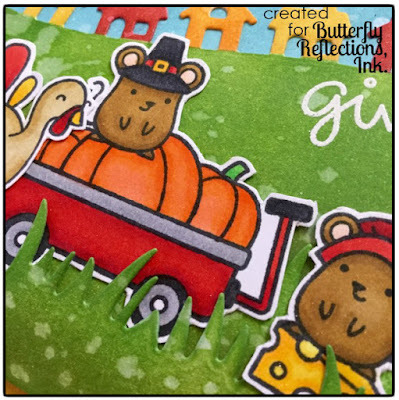 The little mice came from THIS stamp set ( matching dies HERE ) and the turkey from THIS stamp set ( matching dies HERE ). I used THIS ink because I colored the images with some Copic Markers ( the shop has some for sale HERE ). I stamped the sentiment with THIS ink and sprinkled on some of THIS embossing powder and heat set it with my heat gun. I glued everything together with THIS glue. I squeezed some of THIS onto some acetate and let the drops dry overnight. I used more glue to adhere them onto my project. You guys. You need this drops. I need them in all of the colors! They are perfect! Just squeeze some of the liquid onto plastic in various sizes and let them dry. They are so similar to enamel dots it's scary! And they go so far! That's my card! I hope you enjoyed! See you next time!